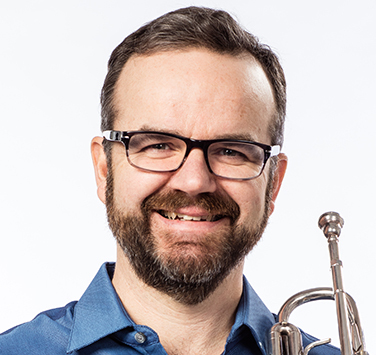 Trumpeter Curtis Dietz is a native of Hanover, Ontario and has been a member of Symphony Nova Scotia since 1996. He is a graduate of the University of Montreal and also studied at the University of Toronto, the Royal Conservatory of Music, and the Banff Centre. Before coming to Symphony Nova Scotia, Curtis was a freelance musician in Montreal performing with the Montreal Symphony Orchestra, I Musici de Montreal, and L’Orchestre Metropolitain. In the summer of 2002, Curtis joined the Canadian Opera Company orchestra for their performances at the Edinburgh Festival in Scotland. In 2005 he was featured as lead trumpet in Neptune Theatre’s production of Chicago. He is currently on the faculty of the Acadia University School of Music. His mother also thinks he is very good. Last but not least, Curtis is the proud father of two wonderful daughters, Greta and Kate, and a son Peter with wife Gina Patterson. Forever (i.e. over 30 years… God help me). Why did you begin playing the trumpet? I ask myself this all the time (usually after playing a wrong note or getting lost in a piece). I guess it looked cool to a five-year-old. My dad had all these Herb Alpert album covers with him in cool leather outfits surrounded by naked girls covered in whipped cream. I play the accordion very badly. Yes, the first time I saw Michael Baker hit a golf ball; VERY funny. Think about new ways to infuriate the viola section.